Jen of Four Marrs One Venus and Julie of White Lights on Wednesday host an amazing cooking competition bi-monthly called “Get Your Chef On”. It’s really fun how they do it. They pick an ingredient that each “contestant” is required to incorporate into their submission. In November, the ingredient was Cranberries. I signed up and was inspired by this awesome recipe from The Food Network: Cranberry Pie. However, I had technical issues and wasn’t able to link up my recipe. I’d like to share my creation with you today! Place all ingredients (except for the crescent rolls) in a sauce pan. Cook on medium until the cranberries “pop”. Continue to cook an additional 2-3 minutes or until the sauce thickens up. Let it cool. Preheat your oven following the directions on the tube of crescent rolls. Open your crescent roll tube and separate the dough into the scored triangles. At the large base of the triangle, place 1 to 1 1/2 tsp of the cranberry filling. Then roll up the dough like you normally would for crescent rolls. Place your completed rolls onto a baking sheet. Bake in the preheated oven following the instructions on the crescent roll tube. Remove the rolls from the oven when lightly browned. Allow to cool a couple of minutes and enjoy! 2. If you decide to make fewer rolls or you have leftover filling, it is wonderful spread on toast. I hope you enjoy this recipe. It really is easy. 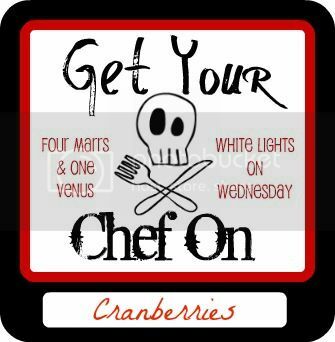 If you like cranberries and want to see other recipes, check out the Get Your Chef On Cranberry Features & Winner along with all the cranberry recipes that were linked up. I’m off to the store to get some more cranberries! Oh yum! These rolls look amazing! Plus, I love how simple they are. That’s my kind of recipe! Thanks for sharing!